So you may have noticed — due to the extra 20,000 people who arrived in town last weekend — that the students are back. 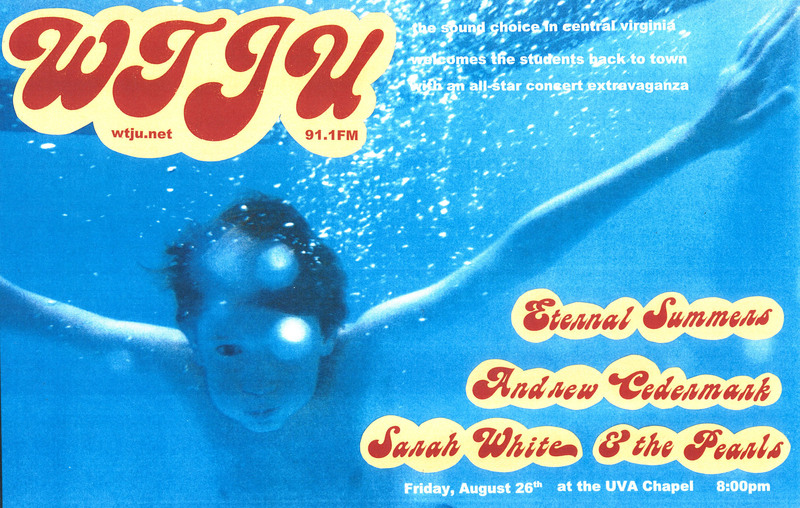 We at WTJU have decided, for the second year in a row, to throw a sort of “welcome-back” show for them (or I guess just a “welcome” show for new students). Fittingly, we’ve selected three of the very finest bands located in the nearby area, and we’re putting on a free show this evening! Eternal Summers are a duo (sometimes trio, these days) from Roanoke who do jangly, hook-laden, ebullient angsty garage-pop; when you hear them play you will love them, and they seem to be writing and performing new songs faster than they can record and release them; their set opening for Borrowed Beams at the Southern a few weeks ago was perhaps the best I’ve heard from them yet, and I’m really eager to hear them again. Sarah White is one of those superlatively excellent performers that makes category distinctions like rock, folk or country seem totally irrelevant; I’ve heard her play dozens of times over the years in various different arrangements, and every one of those has been a musical home-run. The latest version of her backing band the Pearls ain’t bad at all, and they’ve recently recorded some favorite staples from the live-show which sound great. That’s at the UVa Chapel (there’s no more specific name for it, it’s just called “the UVa Chapel” — directly to the Northwest of Jefferson’s famous Rotunda) tonight at 8:00pm sharp; there will also be music provided by WTJU DJs (including, apparently, myself) before, in-between, and after the sets. And it’s free! Come check it out. i *think* the talk by steven vitiello is actually on september 9th, at least according to the UVA music events calendar i have. i’m looking forward to it! oh wait, I am an idiot. that is like, two Fridays from now. this is what happens when I write posts at 1am. oops!